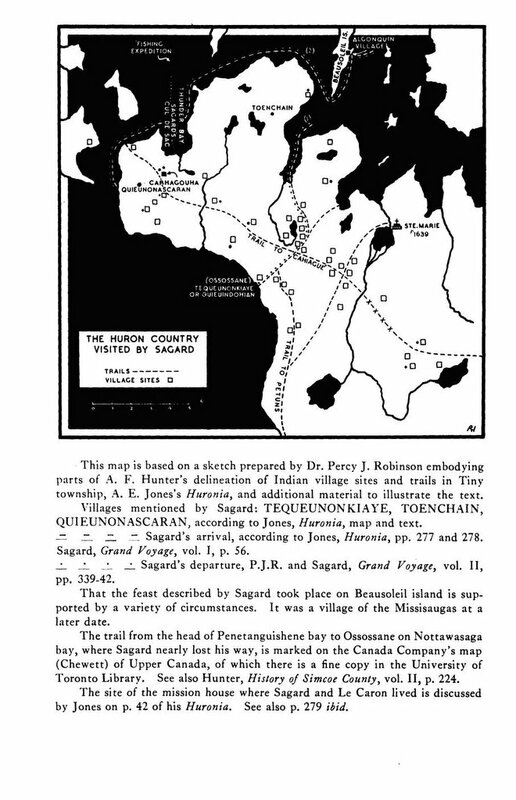 This in an interesting interpretation of Sagard's travels and the villages he visited or mentioned in his first book Long Voyage into the Land of the Huron. Note that his arrival in this author's understanding was via Penetang Bay east of Copeland Creek and Liligan Lake where there are numerous recorded village and ossuary sites. Note also Champlain's travels and villages that he visited 8 years prior to Sagard. Did they visit the same villages? Finding the trails and connecting the dots is another process to assist in village identification. Sagard discribes his arrival in these words "At last, after having walked far accross country, I found two Huron women near a cross roads and asked them which way to take to get to the town whither I was bound; I did not know the name of it, still less which of the two roads I ought to take. ....Finally, through the inspiration of God, I took the right road and, and at the end of some time found my savages.....our town of Quieuindahian otherwise called Tequueunonkiaye....."
This does not sound like a two day hike as some would sugest but then if he arrived by Penetang he would have been with the Bear not the Rock who I thought had the trading rights and hence had brought him here. More reading required I guess.